Today there is an array of outdoor furniture types, styles, materials, and colors to choose from, which can make buying outdoor furniture an overwhelming task. Outdoor furniture allows you to extend your living space to your backyard, creating a comfortable and attractive place to entertain, relax, or dine with family and friends. What to consider when choosing outdoor furniture for your backyard? Asses the following factors to help you choose the best outdoor furniture for your lifestyle, space, and personal taste. We need to consider our climate and maintenance. Outdoor furniture comes in many different types of materials. Certain materials require more care than others and may be better suited for weather conditions in our region. Plastics waterproof, easy to care for, and can be left out during inclement weather (though it may blow over in windy condition). Plastic furniture can also be moved around easily and is usually stackable. It is not as long-lasting as other outdoor furniture and the color can fade over time, but it is the least expensive option. Metal can withstand various environmental factors, durable and low maintenance. Wrought iron is a heavy type of metal, which makes it a good choice for areas that experience strong winds. Wrought iron furniture can easily rust and requires a powder coat finish to protect it from exposure to rain and air. Covering the furniture during periods of rain and repainting any worn or chipped are as will help maintain its appearance. Aluminum will not rust and can be exposed to rain and easily dried, however, it is subject to staining and pitting, which can can dull the surface. It offers the look and feel of wrought iron but is lighter in weight (making it easier to move around) and generally less expensive. Regular maintenance may involve applying a coat of liquid wax at the start of every season. Both wrought iron and aluminum furniture will absorb heat and cold, so we may to purchase cushion or keep it in a shady area. Wicker is low cost, admired for its comfort and durability. Natural wicker (made of rattan) requires regular upkeep as the material’s fibers fade in direct sunlight and are not resistant to moisture. It can also dry out and split in areas with low humidity. Synthetic wicker (made of resin) is a better choice for humid climates or areas with direct exposure to sunlight because it can withstand water and heat. A periodic spray with a hose or brushing with mild detergent is necessary to remove any dirt that accumulated in the crevices of the weave and help keep the furniture in good shape. Wood is resistant to insects and decay, durable and doesn’t absorb heat. Woods commonly used for outdoor furniture include cedar, cypress, redwood, and teak. Regular maintenance varies with each type, though most require an annual application of an oil based stain with water sealer and preservative to protect against moisture and maintain the wood’s natural color. 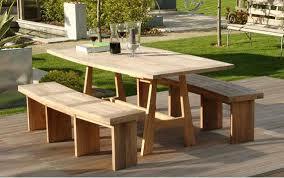 Teak is most durable option and the most expensive. It is the only type of wooden outdoor furniture that can endure all weather conditions without the need of a protective varnish. It is also the best option to place around pools. The next step is defining our space by identifying the amount of open space in out backyard and how we intend to use it will help determine the size, type, and amount of outdoor furniture we’ll need.For instance, maybe we would like to use our backyard for dining and entertainment. Or perhaps we envision it being a relaxing place to unwind at the end of the day. It will ensure our aspirations for the space become a reality by adding the right pieces. Patio conservation sets feel to any backyard and add a welcoming look. They typically include a love seat or sofa, matching arm chairs, and a coffee table. Some sets also come with an ottoman or end tables. 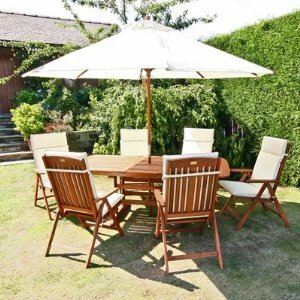 An outdoor conservation set can generally seat four to eight people depending on the number of furniture pieces we get. Most sets feature deep seating with big soft cushions, providing a comfortable place for a casual get together. Outdoor bar furniture provides additional seating for guests to hang out and socialize and it is perfect for entertaining. Outdoor bar sets feature taller tables and seats, some sets come with bar stools while others have bar chairs with armrests and a swivel seat. Bistro sets consists two to four chairs with a small round table. Some sets include folding chairs and a flip top table so it can easily be put away when not in use (perfect for smaller yards). They can be placed around the pool, on a deck, in a gazebo, or under a pergola. Bistro sets are great for enjoying drinks and conversation. 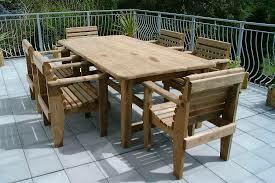 Outdoor dining sets come in a range of size and shapes. It is a mainstay for any backyard affair. Tables can be round, oval, square, or rectangular and accommodate anywhere from four to 12 people. Most outdoor dining sets include an umbrella to keep diners cool and comfortable. Outdoor chaise or lounge chairs are our best option if pure relaxation is the goal. A chaise lounge sits close to the ground and has a full length seat that supports our entire lower body. Most models feature a reclining back so we can adjust to the most comfortable position. An outdoor chaise or lounge chair is great for tanning by the end pool or stretching out with a good look. Selecting our style or theme needs to be done. The style we select should reflect the purpose of our outdoor space as well as complement the overall design of our home. For instance, a rustic wooden picnic table and traditional style cushions can convey a casual, down home feel ideal for family barbecues or a country setting. Streamlined furniture and fabrics in bright, bold colors can liven up a space for entertaining and socializing and work well for various styles of homes. If leisure is our goal, the simple design and natural colors of casual and Tuscan style furniture will entice people to sit down and relax. By evaluating these factors will ensure we purchase the perfect outdoor furniture for our backyard and make the most of our outdoor living space. Consider choosing a style that harmonizes with the architectural design of your home with the wide variety of styles available. Appearance usually is the first consideration. Shop at a store that has a display where you can sit in the chairs, relax in the chaise lounges and check the height of tables to make sure they are functional. Comfort is important. It’s best to buy from a reputable manufacturer willing to back products. A simple test to check the sturdiness of the arm and legs is to lean on the arms of a chair with resin furniture. They should be able to support the weight of an adult without severe bending. The seats and backs of various molded resin chairs, however, are designed to flex to provide additional comfort. Construction quality is important. There should be no extra plastic flashing on the seams of the chairs or tables with resin furniture. The back and bottom of the pieces should be clean with no mold lines or marks. Finishing details are another sign of quality. Reclining mechanisms of chaise lounges and adjustable chairs should operate easily and lock securely. Choosing outdoor furniture used to be a simple thing. A couple of rockers for the porch, a picnic table for the backyard, some folding lawn chairs, and you were done. Now, yards and patios, terraces and decks are essential extensions of our homes, place to retreat and relax, to play and entertain. And, increasingly, we’re furnishing them in high style. People are looking for ways to extend the use of their outdoor spaces. They’re buying more and bigger umbrellas to provide shade, or installing retractable awnings. For cooler nights, they’re buying fire pits, chimineas and free standing fireplaces. A lot of people who have children don’t go to restaurants. They have these big gatherings at their homes that are a more sophisticated version of the backyard barbecue. Many people no longer want a single outdoor furniture piece. They want a complete set to give their outdoor areas a finished look. A typical set may include a table and four six chairs, plus some stationary or action chairs, a chaise and end or side tables. To update an area quickly, the first thing that comes to mind is to create a special nook-a place for one to read or two cuddle. The cuddle chairs are more comfortable than most indoor furniture. They are so cushy, it is hard to believe they are made for outdoors. Some over sized chairs have a canopy, which can be adjusted or removed for sunning or shading. We can choose where to buy cheap outdoor furniture for doing all of them.